Happy Sunday, hope everyone is having a great weekend. Getting there with making over this site, what do you think so far? Winter weather is in full swing today, rain and a severe wind advisory for most of the day. The dogs want nothing to do with it and refuse to even step out to the covered patio. I’m getting better about running in the elements, but not this much wind and will be heading to the gym in a little bit for treadmill time! We’ve also been getting pretty fog in the mornings for our dog walks. I am finally done Christmas shopping and most of the wrapping, I headed to Costco Monday night for a round of gift and grocery shopping because going on a weekend this time of year is just insane. Lots of smoothies this week for breakfast like this pumpkin pie smoothie with Vanilla Bean Orgain Protein Powder, butternut squash, kale, carrots, banana, flax seeds, and pumpkin pie seasoning. 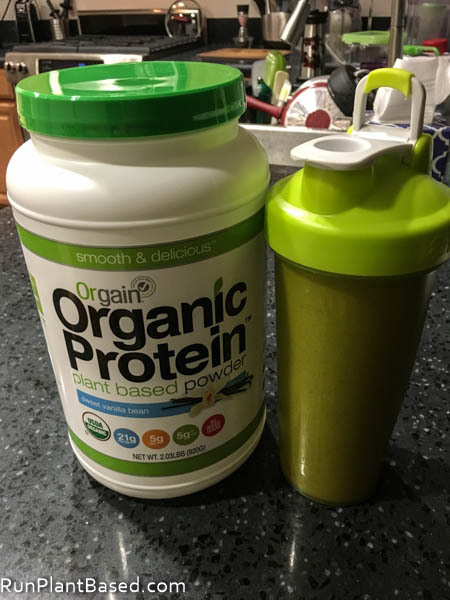 Orgain has a nice, sweet vanilla flavor that blends with a light, whipped texture in smoothies compared to heavier hemp protein powder. It also has a blend of good plant based protein for nutritional diversity – rice protein, chia protein, hemp protein, and pea protein. And it’s not too pricey at Costco or Amazon, nice! I also created a chocolate banana smoothie with kale, carrots, chia seeds and Garden of Life’s Chocolate Raw Protein. 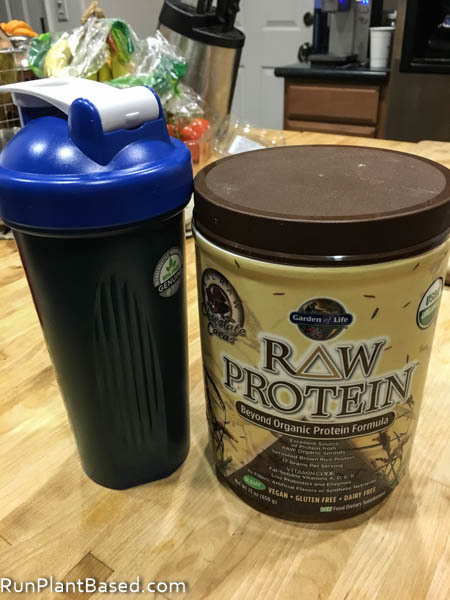 The chocolate flavor is milder on this powder, but the texture is smooth and is a nice blend of sprouted protein with probiotics blended in for a happier stomach around rich holiday eating. I am a huge fan of spicy Thai food and finally tried canned curry paste at home to use with a little coconut milk. 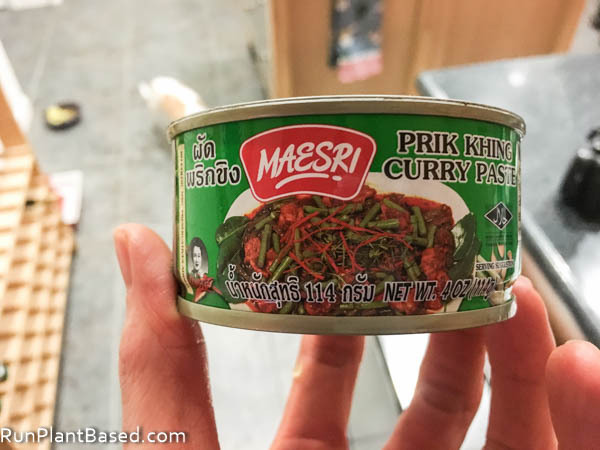 We tried Maesri Prik Khing Curry Paste and just a little bit from this can goes a long way for flavor and spicy heat! You could easily get 4-8 meals out of one of these little cans and they’re cheap on Amazon. 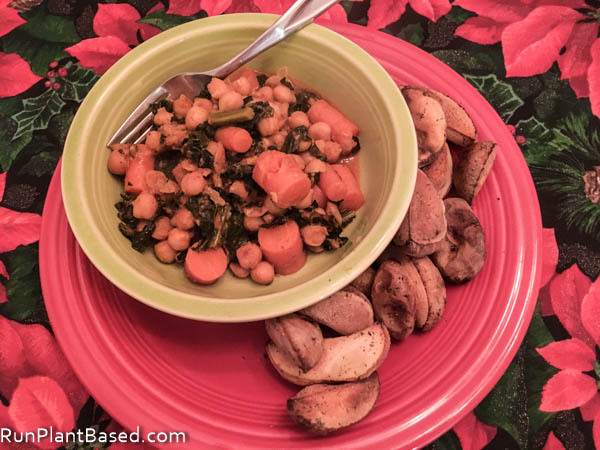 I used half a can of the paste and half a can of coconut milk to make a simple and delicious chickpea, kale, and carrot spicy curry stir fry. The leftovers made a great work lunch the next day too. 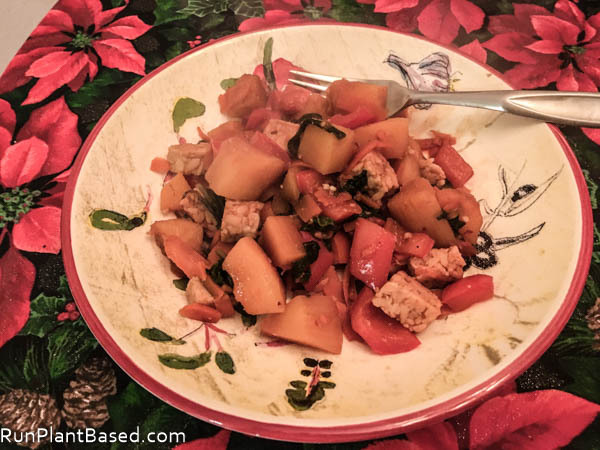 I also made a simple tempeh butternut oil free stir fry with sriracha for a post-gym weeknight dinner. 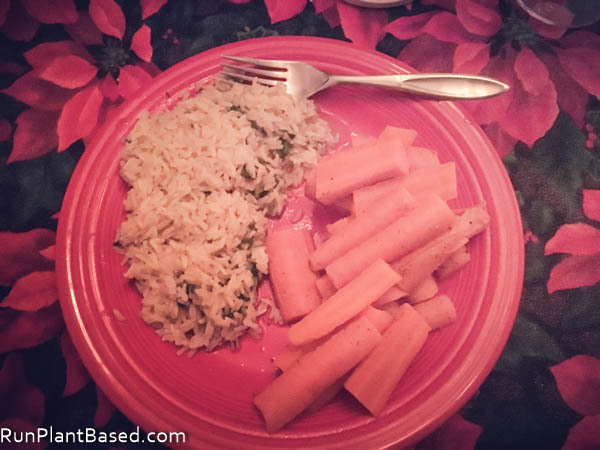 And kept things very simple last night with steamed dill carrots and brown rice blended with kale and spicy green chili sauce. Easy and whole and had to share the carrots with begging chihuahuas of course. On to this week’s list! We were treated to an awesome kitchen demonstration by Miyoko Schinner on the Vegan Vacation at Sea and you can see the full video of it thanks to The Vegan Zombie! How about 15 decadent vegan brownie recipes? And 16 more decadent vegan dessert recipes. Time for another San Francisco road trip! Even Arnold Schwarzeneggar acknowledges the damage factory meat farming is doing to the environment in this article laying out plenty of reasons to give up meat. And more from Arnie here. One Green Planet also discusses the climate change impact of meat. And more on meat and climate change! Goodness, the climate change news has been a little depressing and scary this week. 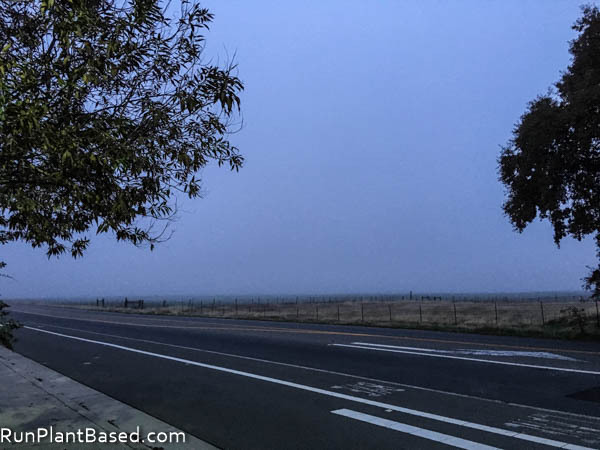 I think it hits home harder for Californians with our epic drought the last few years and threats of not being able to produce food. On a healthier note, is America killing us with junk food? And lighter note, how about another vegan egg nog recipe? Finally, this article has simple advice for vegans dealing with bacon trolls like me at work frequently. 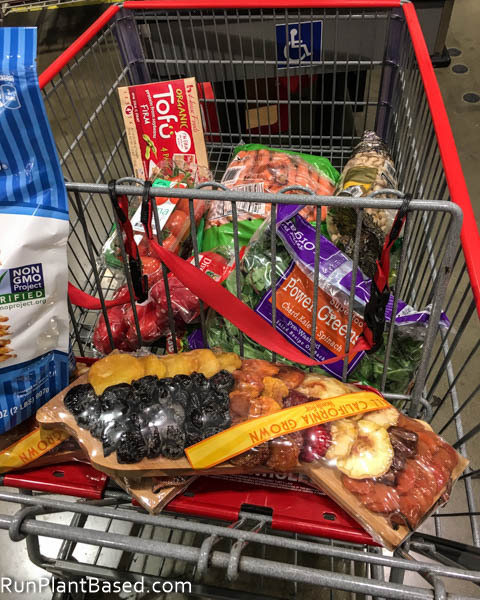 Your weekend meals look delicious!!!! Oh my, I’m such a slacker on weekends. I popped a few grapes and crackers and called it dinner. Oh well. My dogs are the exact same, windy and cold and they will NOT get off the couch. It’s ridiculous warm where we live, we are supposed to be getting pounded with snow and it’s 66 degrees today, insane! I’ve had dinners like that too and sometimes crazy, whatever is in the kitchen combos to work lunches! Wow, the weather is crazy for you too! I guess enjoy the warmer temps while you can! Great links, I especially liked the one about dealing with bacon trolls. Thanks! And wow on the warm temps, that’s crazy! Thanks! It was time for a change and glad you like the recipes! :-) It’s the Green Dragon chili sauce from Trader Joe’s and it’s great with grains and bean dishes. Wonderful, thanks so much Christine! It is, I need to order more from Amazon – such a simple thing to keep in the pantry! Me too, I always have at least one of their protein powders and/or supplements in our pantry! I should and will soon, need more time this week – lol!